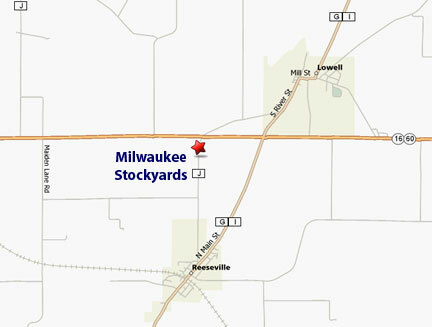 Where is Milwaukee Stockyards Located? The Milwaukee Stockyards is conveniently located 8 miles east of Columbus in Dodge County. Our facility is 1/10 mile south of Hwy 60/16 on County Road J.
Click on the map at the left to link to Mapquest. You’ll find a more detailed map along with driving directions.